Double unders are a skipping maneuver performed where the rope swings under the feet twice for each individual jump. This ultimately means that you have to jump higher than you would normally, while also skipping the rope faster than you would normally. This further increases the intensity of the exercise, increasing metabolic cost, and subsequently the amount of energy burnt. It also further increases the coordination required to perform the exercises effectively. Now, the thing is, double unders are difficult. As a result, not just any old skipping rope is going to get the job done. You need a skipping rope that is weighted evenly and has good quality handles to ensure it has the weight and capacity to actually spin fast enough to allow the successful performance of a double under. Fortunately, in a market that is full to the brim of cheap and nasty skipping ropes, we have done the ground work for you. The following review provides an extensive review on what we believe to be the 7 best skipping ropes money can buy! What To Look For In A Jump Rope? The first cab off the rank The 321 Strong Aluminium Crossfit Jump Rope offers extremely high end construction, using steel skipping wire coated in PVC for an extremely durable and smooth skipping experience. 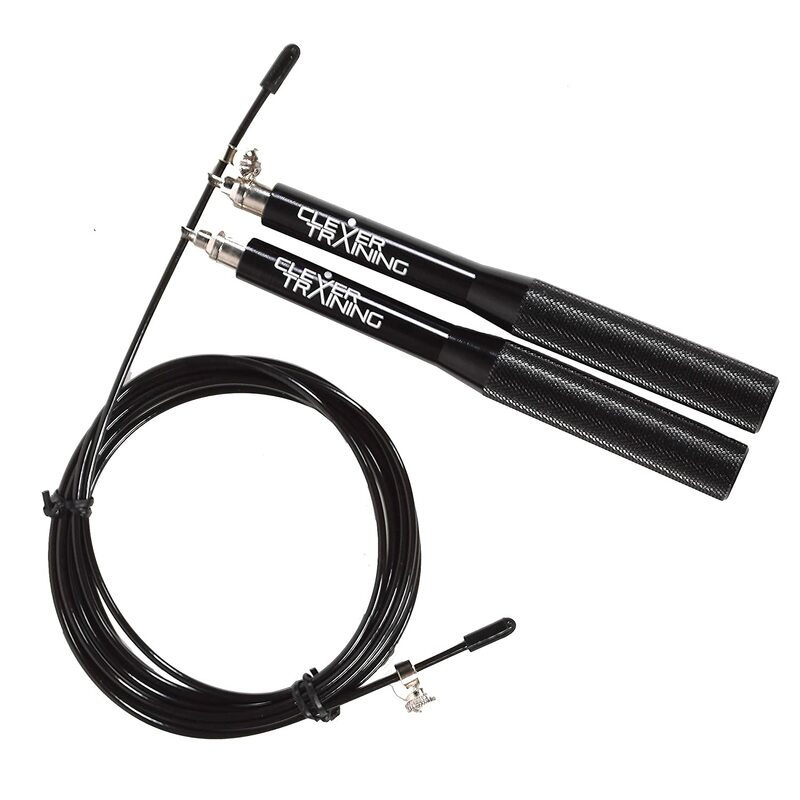 While this jump rope does come in at a slightly higher price, it is worth the money, offering height adjustability and high quality aluminium handles. Next up is the RitFit Speed Jump Rope. This skipping rope comes at an affordable price point, and offers adjustable length, making it suitable for individuals of all heights. Utilizing a lightweight plastic design, this rope is designed with high RPM’s in mind, making a suitable choice for those aiming to do some double unders. The Clever Training Aluminium Speed Rope is a fantastic choice, offering an adjustable jump rope at a pretty decent price. 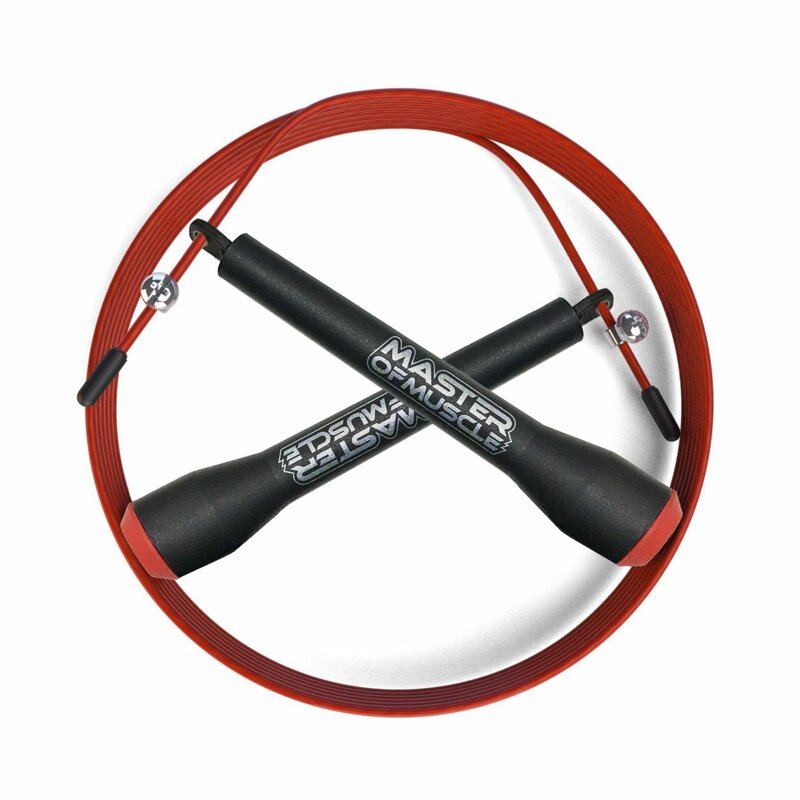 This rope is constructed with fast swivel bearings to allow the extremely high RPM’s, and has anti-slip handles making sure you don’t lose your grip during a solid jump rope session. Next up we have the WOD Whipper PRO Jump Rope. Despite what might appear to be an unnecessarily long name, this jump rope caters to high level CrossFit athletes, using high quality materials and a lightweight design to provide a top quality product. This rope uses ball bearing construction to maximize RPM’s and make double unders a reality. The Limm jump Rope offers a fully adjustable jump rope using a high quality ball bearing system to completely eliminating rope tangling. It uses innovative foam handles that eliminate slipping while also providing extra comfort. This rope offers an extremely lightweight option at a very affordable price. 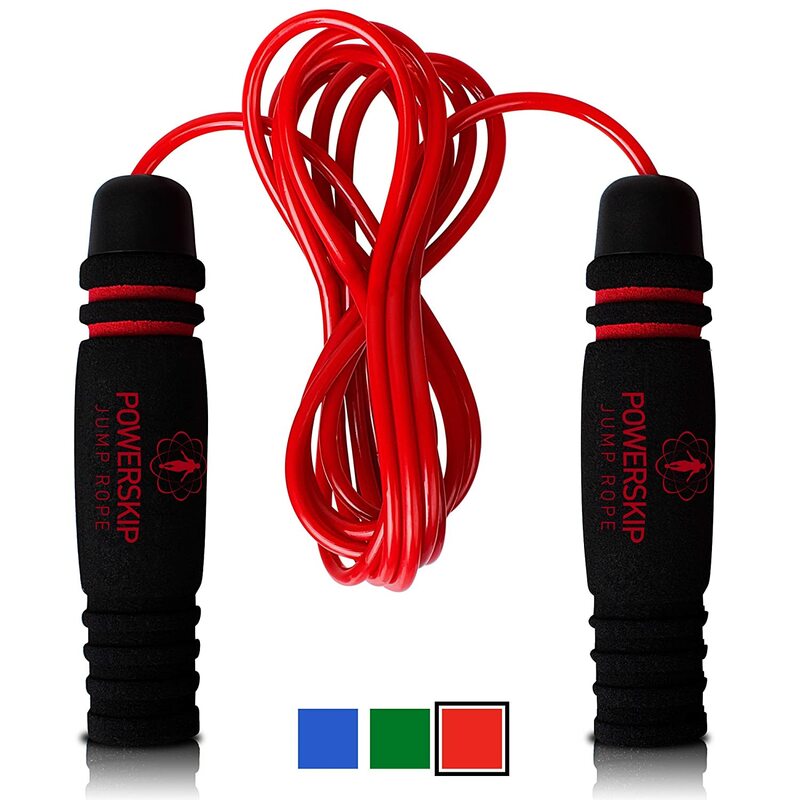 The PowerSkip Jump Rope provides an extremely high quality jump rope at a decent price point. This rope utilizes a ball bearing system within the handles to ensure that you get fast and smooth cable rotations. It further uses lightweight memory foam handles for extra grip and comfort, making it easy to use for those longer sessions! 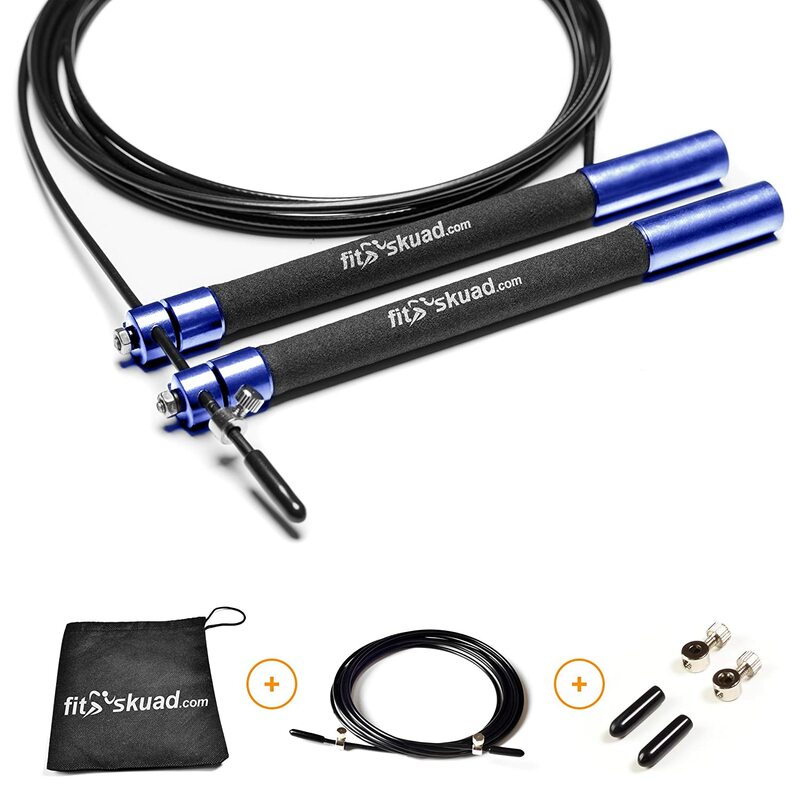 Last but certainly not least we have the FitSkuad Premium Jump Rope. This jump rope comes with a ten foot adjustable cable, making it suitable for individuals of all heights. It uses extremely high quality construction, with aluminium based memory foam handles for both increased safety and comfort. This Jump rope is designed by 321 Strong, and while it does come in at a higher price point, it is arguably worth the extra money. It comes with 6 inch long aluminium handles, wrapped in a durable foam for extra grip. This jump rope comes with the longest adjustable cable available on the market, coming in at a 11 feet long, literally making it suitable for people of any height! The rope is made with braided steel wire with a PVC coating, and uses ball bearing constructed handles for an extremely high spin rate. This rope comes with a replacement cable and extra thumb screws, in case something does go wrong.This cable is well renowned for its high durability, and extremely good quality, often touted as one of the best jump ropes available on the market. The RitFit Jump rope is one of the most affordable ropes on the list, but don’t let that act as a deterrent in any way. This jump rope uses high quality wire cable that won’t tangle or twist, and allows a smooth and controlled rotation. This cable is 10 feet in length, and adjustable, making it a suitable option for people at either end of the height spectrum. Furthermore, this jump rope is particularly light, making it perfect for double unders. 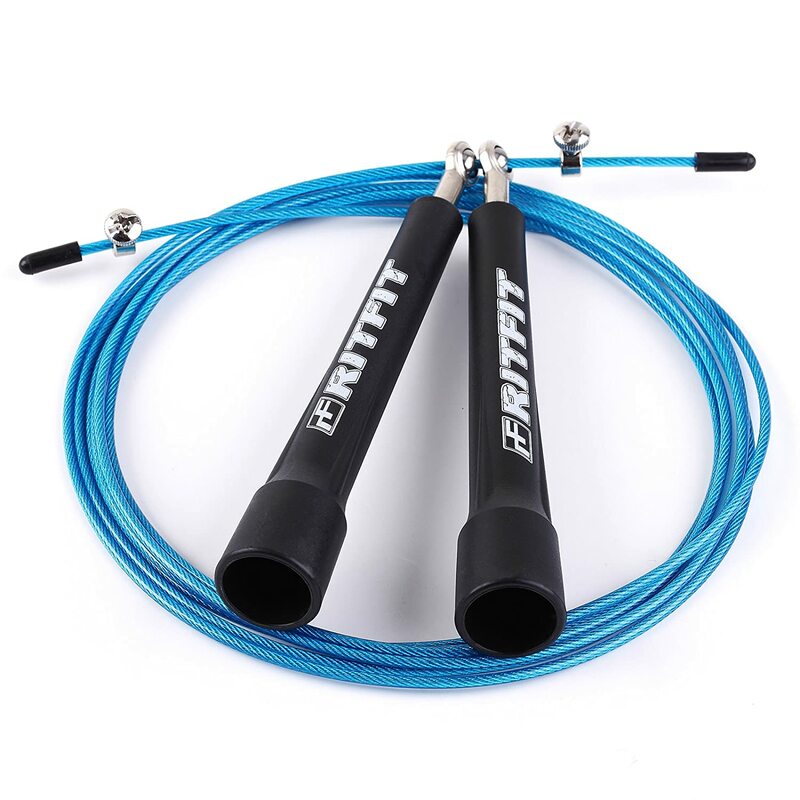 As an added bonus, the RitFit Speed Jump Rope comes with a carry bag, making it an extremely portable option that can be taken with you anywhere to provide a solid and intense workout. Despite its solid construction, the pivot points where the ropes meet the handles have been said to breakdown after extended use, somewhat putting its durability in question. Clever Training offer a high quality jump rope made with extremely durable materials. The rope is made with high quality PVC coated wire, and fast swivel bearings, making it cable of achieving the high RPM’s required for double unders easily and efficiently. This rope uses high quality aluminium handles with a non-slip grip, and comes in weighing a mere 220 grams, making it one of the lightest jump ropes on this list. It has been applauded by uses for its durability, and extremely high quality, having been reported to last for years without taking any noticeable damage. While this rope does come in at a slightly higher price, it is unquestionably worth the extra money. The WOD Whipper PRO Jump Rope is made by Master of Muscle with the CrossFit athlete in mind. It offers a 10 foot adjustable cable, made with high quality Thermoplastic Polyurethane coated wire and ball bearing construction to allow extremely fast skipping rates. This makes it an ideal option for those looking to master double unders. It offers extremely durable construction that will not kink or twist, and has been said to last an extremely large amount of intense use. As a bonus, this rope comes with free workout guide, a carry case, and a spare screw set, making ideal for those looking for an option they can take to the gym with them, and can repair themselves if the need does happen to arise. Despite its high quality, there have been reports of the coating fraying with use, leaving the bare wire exposed. This can become dangerous if the exposed wire connects with bare skin. The Limm Jump Rope offers a high quality jump rope for an affordable price, which is perfect for individuals of all experience levels. The Limm Jump Rope is fully adjustable, making it perfect for individuals of all heights, and utilises a high quality ball bearing in its construction ensuring there will be no annoying twisting or tangling. The handles are made with foam that provides a comfortable grip that won’t slip during an intense workout. 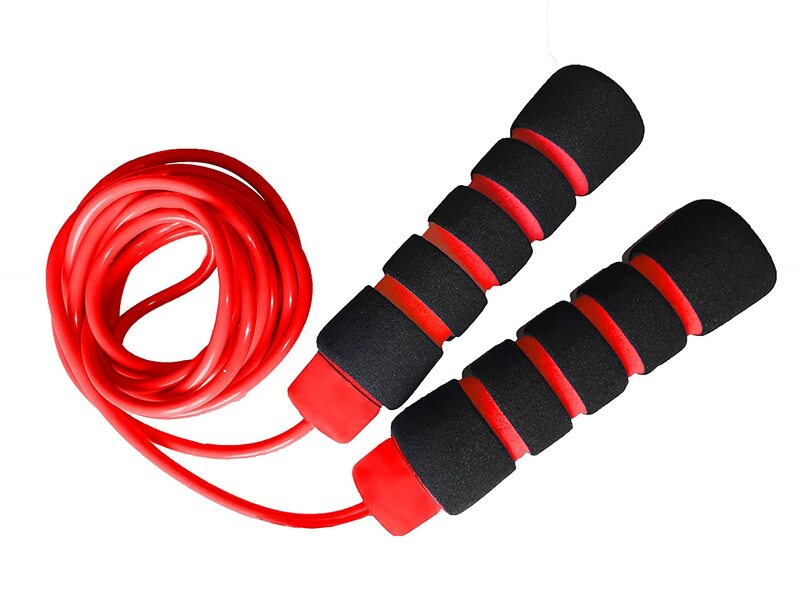 Furthermore, this jump rope is extremely light and portable, making it a great option to take on the road or to the gym. Despite its high quality handles, this rope has been said to fall apart under moderate levels of stress, and wear with only little use. 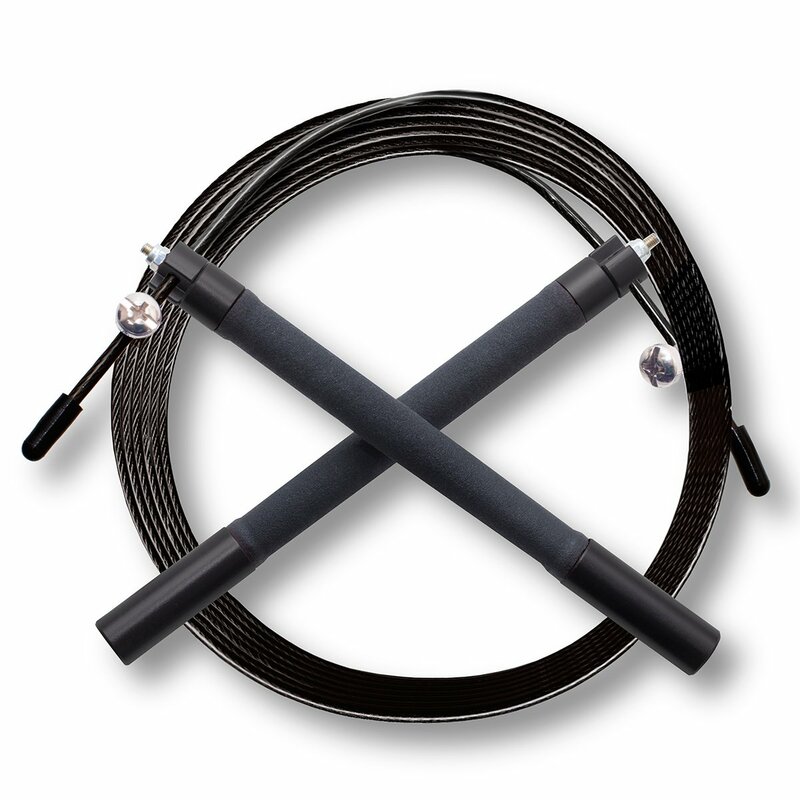 The Power Skip Jump Rope uses an efficient and high quality ball bearing cable system to ensure smooth and fast rotations, making this option extremely suitable for those individuals looking to perform double unders at a high level. This jump rope comes with a high quality and durable memory foam handle that will reduce slipping and maximise comfort, and is fully adjustable, suiting individuals of various heights. This jump rope also comes with an additional training video, ensuring that you get the best out of your workouts. Despite its good quality handles and cable system, the coating surrounding the wire has been said to fray easily under stress, and as such may not be as durable as its lifetime warranty suggests. The Premium Jump Rope by FitSkuad is the most expensive jump rope on this list, and for good reason too. The premium jump rope comes with a fully adjustable 10 foot long cable, making it suitable for people of various heights. It is also extremely lightweight, and uses a high quality PVC coated cable for increased protection and durability. It has high quality aluminium handles with a foam grip to ensure there is no slipping, and utilises ball bearing construction to guarantee a high spin rate. This makes it ideal for double (or even triple!) unders. This jump rope also comes with a free ebook, set to teach you how to easily master double unders, and a handy carry case so you can take it with you wherever you go. It has been described as both extremely durable and long lasting, and his been supported for its strength and comfort. While it may seem like a pretty simple piece of equipment, upon closer inspection it becomes apparent that there is more to the jump rope than first meets the eye. A good jump rope needs to use high quality materials to ensure it will last under high levels of use. More than that, it needs to utilise construction that allows a high RPM’s to be achieved, without tangling and twisting. This makes it possible to perform double unders with ease. A good quality jump rope also needs to be adjustable and lightweight, so it is suited to people for various heights, and easily moved from place to place, making it a tool that can be used literally anywhere. So in conclusion of our extensive review, we believe the best available Jump rope available on the market today is the 321 Strong Aluminium Jump Rope. While not the most expensive jump rope available on the market, it does provide the best level of construction quality, using high quality materials to bring an extremely well rounded product to the table. Additionally, it offers the largest cable length on the market, making it suitable for people of any height, and uses an efficient ball bearing system to promote high RPM’s, and subsequently, easily achievable double unders!